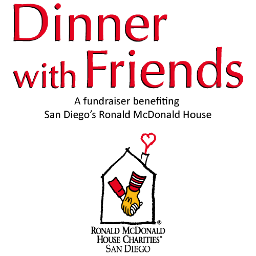 Have you bought your tickets yet for the Dinner With Friends in support of the Ronald McDonald House of San Diego? Since 1980, Ronald McDonald House Charities of San Diego has provided a “home away from home” to families pursuing essential pediatric treatments at San Diego hospitals. What started as an 8-room bed-and-breakfast service for families of young cancer patients is now a center of nonmedical care and support for families whose children face a whole range of life-threatening conditions. In 2009, we opened a state-of-the art Ronald McDonald House with 47 guest rooms, pleasant outdoor courtyards and cheerful play spaces for children. This expansion quadrupled our capacity to house families and allowed us to open a Family Care Center for day visitors. All of those services for all of those people cost a lot, even with so many volunteers giving their time and skills to help. How about you? The 3rd Annual Dinner With Friends is coming up soon--March 1st! Buy your tickets HERE! Don't miss this fun opportunity to help families stay together during such a stressful time.